FINALLY, the day of reckoning is here and there appears to be no hiding place for some powerful Nigerians who may soon face trial for their ignoble role in the $180 million Halliburton bribe scandal. The powerful Nigerians who may have been indicted by the Presidential Panel on the Halliburton scam are said to be making frantic efforts so as to be given soft landing by the panel headed by Inspector General of Police, Sir Mike Okiro. National Daily usually reliable sources reveal that the panel constituted by President Umaru Musa Yar'Adua has concluded investigation on the matter, and is about to formally present its report to the presidency. Members of the panel include representatives of the Nigeria Police Force, National Intelligence Agency (NIA), State Security Service (SSS), Economic and Financial Crimes Commission (EFCC) and Ministry of Justice. Sources disclosed that more prominent Nigerians that have been indicted are among those believed to be members of 'the untouchables' who benefited from the multi-million dollar loot. Among them are Prince Ado Bayero, son of the Emir of Kano, Alhaji Ado Bayero and Alhaji Abdulkadir Abacha, younger brother of the late military dictator, General Sani Abacha. National Daily learned that the report did not totally exonerate three former Heads of State, General Sani Abacha, Abdulsalam Abubakar and Olusegun Obasanjo who are widely rumoured to have benefitted. Sources said that the panel could not secure sufficient evidence to indict former Vice President Atiku Abubakar. Sources said that when it became obvious that the Okiro panel which itself is under international and local pressure to expose faces behind the veil was not ready to spare anyone no matter his status, some prominent Nigerians whose identities have been unveiled began to panic. “They have been sending all sorts of people to members of the panel and making phone calls to Okiro begging him not to indict them in the final report. Sources said former Nigerian leaders, Chief Olusegun Obasanjo, General Abdulsalam Abubakar and Emir of Kano Alhaji Aminu Ado Bayero have been appealing to President Yar'Adua and Okiro to soften the Panel's report on their role in the Halliburton mess. Bayero intervened on behalf of his son Prince Ado Bayero who was named as one of the benefactors. These influential Nigerians were said to have also reached out to some eminent Nigerians close to the Yar'Adua, Okiro, and other members of the panel urging them not to “humiliate” them. “Okiro was very angry when he received one popular politician who came to beg him on behalf of a former number one citizen of Nigeria. He told him in unmistakable terms that he cannot compromise his responsibilities. He made it clear to him that “if your Oga is guilty he will pay the price” said one knowledgeable source. National Daily learned that Obasanjo, Abubakar and Ado Bayero were scared that the Okiro Panel is determined to discharge its duty to the letter so they turned to President Yar'Adua for succor. Bayero was said to have solicited for the assistance of Sultan of Sokoto, Alhaji Sa'aad Abubakar while General Abubakar contacted former President Ibrahim Babangida to intercede on his behalf. 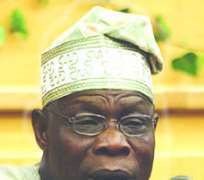 Obasanjo was said to have had several phone discussion with Yar'Adua and further interacted with him through a mutual friend of the two. Former Chief of Air Staff AVM AD Bello and former Inspector-General of Police Muhammed Dikko Yusuf former Petroleum Minister, Chief Dan Etete and former Group Managing Director of Nigerian National Petroleum Corporation (NNPC) Gaius Obaseki were also named in the final report. National Daily learned that a British lawyer Jefrey Tessler and Wojclech Chodan were the go-between the consortium and the Nigerian government officials between 1994 and 2004. Tessler was said to have paid the sum of $75,000 to Yusuf on February 25, 1997; promising to pay the balance on August 11, 1998. Tessler claimed he paid the sum of $500,000 into a Swiss Bank account belonging to Etete on February 10, 1998. KELLOGG, BROWN and ROOT LLC which are members of the Halliburton Consortium, had in early February pleaded guilty to charges of bribing some Nigerian government officials and politicians in order to be awarded the contract for the building of the $6billion Liquefied Natural Gas (LNG) in Bonny, Rivers State. KELLOGG agreed to pay $400million fine. Amidst fears that the Yar'Adua administration intend to cover up the Halliburton scandal because of the Justice Minister, Michael Aondoakaa's threat to sue KELLOG for smearing Nigeria's image the administration quickly issued a statement to debunk the assumption: “the President is not and will not protect anybody. He has asked me (Aondoakaa) to proceed to prosecute anyone found culpable. And we will go to any length to bring them to book” the statement said. Tessler and Chodan were alleged to have paid the sum of $133.5 million between 1994 and 2004 to Nigerian officials on behalf of the consortium for the LNG contract estimated at $6bilion. National Daily learned that the names of three former Heads of State featured consistently at different stages of investigation. Some of those who were quizzed could easily be linked to them even as they allegedly made 'useful' statements. For instance, Alhaji Abdulkadir was said to have acted as a link between the consortium and his late elder brother, General Sani Abacha. He was also said to have personally benefited from the bribe. Tessler and Chadon allegedly agreed to pay $40 to $45 million to Abacha on November 2, 1994 based on the condition that TSKJ will be awarded the contract to construct 1 and 2 trains of the LNG project. Prince Ado Bayero was also alleged to be among the prominent Northerners who benefited from the multi-million dollar loot. Sources said one of the go-between the Consortium and Nigerian officials, Chodan, alleged that Tessler told him on September 18, 1998 that an undisclosed sum of money had been earmarked to pay the new Head of State, Abdulsalam Abubakar. However on July 7, 2003 the sum of $2.5 million was allegedly transferred to a Swiss Bank account controlled by Abdulsalam Abubakar. It was further revealed that on March 18, 1999, Tessler and his bosses set aside $32.2 million to be used as bribes in the event that the bid by TSKJ for the train 3 contract was unsuccessful. Sources said the panel was told that TSKJ agreed to pay $23million to be used as bribe for the top government official, Olusegun Obasanjo on June 28, 2002. However, the money will be paid on the condition that TSKJ was awarded the contract to construct train 6, of the LNG project. During the Obasanjo Administration, Tessler allegedly wired $1 million in one hundred dollar bills delivered in a pilot's briefcase to an NNPC official to be used for the benefit of the Peoples Democratic Party (PDP) in August 2002. Tessler further wired $500,000 (in Nigerian currency) delivered in a vehicle to an NNPC official to be used for the benefit of the PDP. National Daily learned that the “NNPC official” being referred to by Chodan, is Gaius Obaseki, the former Group Managing Director of the Corporation. Obaseki was said to have also received $5 million from the Consortium on behalf of PDP. Bodunde Adeyanju, an aide of former President Obasanjo who was arrested in connection to the $180 million Halliburton bribe scandal was asked by the presidency to manage the slush fund. Adeyanju allegedly told the panel that all the money he collected from Obaseki was passed to Lawal Batagarawa, a former Minister of State for Education under the Obasanjo Administration. Adeyanju is the same presidential aide who during the mud-raking disagreement between president Obasanjo and his then Deputy, Atiku Abubakar, allegedly mismanaged the funds of the Petroleum Development Trust Fund (PTDF). He was accused of withdrawing N3 billion from the PTDF deposit in the defunct Trans International Bank (TIB). Adeyanju was released from detention last Wednesday after his alleged Confessional Statement on the Halliburton bribe Brouhaha. National Daily learned that after Adeyanju was freed that Wednesday, the panel summoned Batagarawa to confirm Adeyanju's statement that he took custody of the bribe money. Batagarawa was Presidential Adviser on non-party relations in Obasanjo's administration at the time of the Halliburton bribe offering, told the panel that he only collected a quarter of a million dollars from Adeyanju. The panel could not immediately resolve how much of the $5million inducement fund Obaseki gave to Adeyanju and the amount in cheques he, Adeyanju, issued to the PDP at various times. National Daily learned that Yar'Adua was disappointed that two former Heads of State, Obasanjo and Abubakar were linked to the Halliburton bribery scandal. He perceived their alleged involvement as a dent on the high office they formerly occupied and a smear on the country's international image. However, the President was said to have given the Okiro Panel carte blanche to investigate the allegation and recommend those found culpable for trial. “Yar'Adua has so far rebuffed all, including former Heads of State, who urged him to restrain Okiro from going ahead to indict them. The President, who is battling to gain the confidence of Nigerians that it will not be business as usual, said he does not want to intervene in the investigation,” an inside source said. National Daily learned that Yar'Adua's political advisers were excited by the connection of Obasanjo to the Halliburton scam. “You know he is a typical” holier than thou” person”. We will be happy if he is indicted so that he will no longer be a stumbling block to Yar'Adua's re-election ambition in 2011, he will either be in jail or still battling with credibility problem” said another inside source adding that: “If you live in a glass house don't throw stones. Yar'Adua is not a coward; if Obasanjo is indicted he will be arrested and tried for corruption. No one is bigger than the nation. After all he no longer enjoys immunity”. National Daily learned that the Panel in order to ascertain thorough investigation visited several foreign countries including United States, United Kingdom, France, Germany and Switzerland, was able to take possession of vital document that conclusively established the culpability of those named in the Halliburton bribery scam. Investigation on the Halliburton $180 million bribery scam further revealed that Tessler allegedly used construction giants Julius Berger Plc to distribute the sum of $11 million to two former Heads of State, a former chairman Board of Trustees (BOT) of a political party, a former Deputy Senate President and a political party. However, Julius Berger spokesman, Clement Iloba denied the allegation. “we are not involved” he simply said and declined further comment. Meanwhile Nigerians are eagerly waiting for IGP Mike Okiro and his panelists to know when the mighty fat cats will disgorge their ill-gotten wealth.